Carolina Tiger Rescue keeper Larissa does operant conditioning training with Roscoe Tiger. Roscoe and his enclosure mate Camilla came to the sanctuary from a facility in Ohio that shut down. Before that, Roscoe was a product of a private breeder. This big, handsome cat is a very anxious one, who is easily frightened. 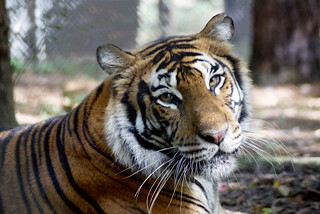 Larissa uses operant to correct some of those behaviors, and it’s one of several reasons Carolina Tiger keepers go through the training sessions with some of the animals. It’s clear as Larissa demonstrates one of her sessions that she has earned Roscoe’s trust!